Middlesex Tennis are here to support Middlesex Clubs through providing funding opportunities, equipment hire for open days or competitions and can help advise on any queries clubs may have (or direct you to someone who can help). Promote your club and coaching programmes through Open Days and Great British Tennis Weekends (GBTW). GBTW are national weekends organised through the LTA to get new players into tennis or players returning to the game. Hold Fun Tennis Activities, Cardio Tennis Sessions, Mini Tennis Competitions to promote Tennis in your area. Middlesex tennis are here to support you and can loan you equipment such as Zsig Mini Tennis nets and rackets to support your open days. Get in touch with us at county.office@middlesextennis.org.uk. Host a Sadie's Day at your club to inspire others to play tennis and raise awareness of allergies. For more information for Sadie's Day click here. British Tennis Festivals are a fantastic opportunity for clubs and venues throughout the country to host fun, themed recreational competitions for local players. Last year saw 922 tennis venues involved in the 2017 Tennis Festivals programme which was sponsored by Benenden. This created around 40,000 opportunities for players to take part in fun, local competitions. New packs include medals, certificates, posters and a host of online resources. Middlesex Tennis are pleased to announce that as a benefit of registration they will provide funding support all Middlesex registered clubs wishing to purchase a defibrillator. Middlesex Tennis will contribute £660 towards the total cost of £1,320 to any club wishing to purchase this life saving piece of equipment. 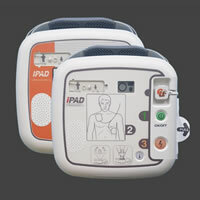 A defibrillator gives the heart an electric shock in cases of cardiac arrest. Acting quickly when someone is in cardiac arrest and fighting for their life is crucially important. For every minute that passes without CPR and defibrillation, chances of survival are reduced by 10%. We have chosen to work with Hampshire based WEL Medical to provide the iPAD SP1. This stands for Public Access Defibrillator and is a nominated device of the British Heart Foundation. The iPAD SP1 is designed to be used by laypeople who will be able to familiarise themselves with the device through online videos and pictorial quick reference guides. In addition to this, during operation the iPAD uses a series of illustrations with flashing lights and calm voice prompts to talk a rescuer through how to use it. For the first twenty five clubs that purchase a defibrillator, Middlesex Tennis will contribute £660 – 50% of the total cost. Thank You Barnet Tennis for hosting the first of our Venue Forums! Great discussions. If you didn’t make it today, our second Venue Forum is on Weds 17th Oct 7-9pm @thequeensclub! Meet our team @johnlove9174 @sangeetaa88 @markbollobullock and find out how we can help you!